Point guard Gene Stage is one of the reasons the 1950s is considered the Golden Age decade of Hurricane basketball. A member of the 1,000 point club, Stage put up 1,192 points during his Varsity career, a time when freshmen didn't play, seasons were between 20-22 games and field goals were only two points! Over his career Stage made 450 field goals and 292 free throws. 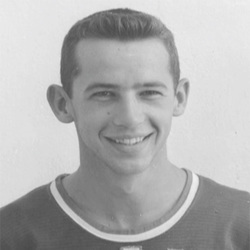 He led the team in scoring for both his junior (461) and senior (353) seasons, while playing under legendary coach and UM Sports Hall of Fame member Bruce Hale. Coach Hale thought so much of Stage that he was selected team captain for the 1956-57 season. At the time of his graduation, Gene was UM's carrier scoring leader. Upon graduation, Stage was named an assistant coach under Hale. An Indiana native, Stage graduated from the University of Miami with a Bachelor's in Education, and now lives in Ponte Vedra Beach, Florida.